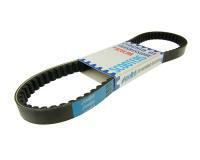 Kevlar Maxi belt from Polini. The most durable v-belt Polini offers has additional aramid fibre inlays that make this belt extremely resistant to tearing. This is not Polini’s top choice for the race track for no reason. The grip is so good that, despite the high aramid content, the belt slip is heavily reduced when cold.